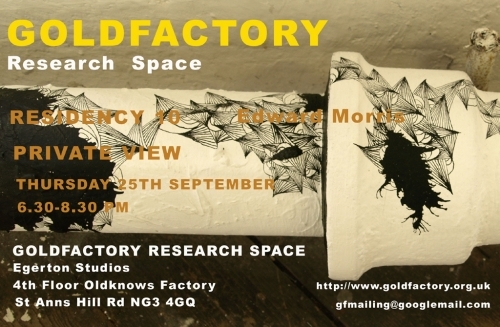 Goldfactory is currently unfunded and all shows happen through the time and effort of volunteers. If you’re an artist, what kind of art do you make? Edward Morris works and lives in Nottingham and spends his time creating his work between his 2 studios, 1 which is near the centre of Nottingham, which is larger than the studio in the loft of his house. This creates an interesting dialogue in his practice between the work produced in the 2 spaces as scale of his work is often increased significantly in the studio away from his house. His work is now progressing at a rapid rate as he is now completely focused on his art after retiring from the rat race. His current series of paintings/drawings, “hypochondria drawings”, are influenced primarily by the different daily aches and pains that he feels, or at least believe that he feels! However, they also reflect upon his previous series of work surrounding scientific research in to the possible, and increasingly probable, existence of parallel universes. In this series he is drawing maps which start with his aches and pains, borrow from the M-theory, and steal from my subconscious, as well as drawing inspiration from Lousie Bourgeois’s “Insomnia” drawings. Further images of this work will be uploaded on to this page soon, and any feedback will be greatly appreciated. If you have any interest in purchasing any of the work shown on here please contact the artist for further details and pricing via this website. Unpopular Cultures at the De La Warr Pavillion curated by Grayson Perry. As is the case with Grayson’s currating, fascinating once you hear his method behind the curating process.